The Sports Guru returns! So where have I been for 2+ years? Enjoying life, getting fat, driving my kids around, listening to World Cup Cricket on XM-radio. You see it turns out there are so many other great sports to follow other than just professional Baseball, Basketball, Football and Hockey (I still consider Hockey one of the “Big 4” sports). When I last wrote this blog I was aiming it at those readers who wanted to learn about sports so they could be more comfortable discussing sports in the workplace or in social settings. While I still hope to educate those who need it, this time around I’m going to concentrate on those sports and stories that don’t necessarily hit the back pages of the newspapers (yes Virginia, there are still newspapers) everyday. Today’s lesson is Cricket. 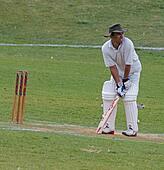 If your still with me, Cricket turns out to be a great sport to follow if your unemployed or have a sleeping problem. An average game is 6+ hours and the guys who call the game on the radio for 6+ hours drone on and on in their British/Indian or British/West Indian accents. A quick primer on the current World Cup of Cricket being played in Bangladesh, India and Sri Lanka. It turns out it was also supposed to be played in Pakistan, but they were stripped of that honor when a terrorist group opened fire on a bus carrying the Sri Lankan National team back in 2009 killing six police officers and two civilians. Six members of the cricket team were injured, but nothing serious. What a great sport! Terrorist groups care so much about their National teams that they ambush the other teams while driving to the stadium for a game. The World Cup involves fourteen national teams. Ten of them are powerhouses in the sport and four others might be considered the “minor leagues” of the cricket world. The “minor league” teams have been eliminated after the opening round of the tournament. One of those teams, Ireland did have their moment of glory while beating England. The pubs did very well that night in Dublin and Irish doctors are expecting a very large number of births in early December (that match was played on March 2nd). So just how do you play cricket? Here is my take as a big ugly American using Baseball as a comparison. Cricket is played on an oval shaped field with tiny fences guarding the field all the way around. Think of the Green Monster at Fenway Park in Boston minus 36 feet. The action takes place in the middle of the field. Remember when we were kids and we played running bases on the front lawn of Jimmy’s house? Now take the running bases thing you are thinking about and place it in the middle of the oval. Stay with me now as the fun stuffs coming. Now picture two guys wearing hockey goalie equipment with funny looking baseball bats (one side is sort of flat) standing in the middle of the oval. Behind each of these guys is a bunch of wood sticking out of the ground with a tiny piece of wood laying across the top. I could use all the technical terms here to impress you (stump, wicket, crease etc…) but no American sports fan really cares. So now we have two batters (the guys wearing the goalie equipment) and the two bases (the wickets). What we need now is a guy to pitch the ball. They call this guy a bowler. I don’t know why, so don’t ask me. Bowlers come in all shapes and sizes. Some throw fast, some slow and some throw curve bowls (spinners). Besides the bowler the team in the field has 10 other players. One guy is the catcher (wicket keeper) and the 9 other guys spread out all over the oval. They have really fancy names for the positions these guys play but it will not help you understand the game any better. Remember because it’s an oval, some guys get to stand behind the batter. We have two more guys on the field also, they are the umpires. Think of them as the home plate umpire who stands behind second base (don’t ask) and the first base umpire. Now we are ready to play. This next part is going to go by real fast so be ready. For the current World Cup each team comes to bat once. They get to stay at bat until 10 batters have made an out (remember when we played everybody bats during an inning?) or the pitchers have thrown 300 balls. The 300 hundred balls are neatly divided into things called overs. 50 overs of 6 balls each. Pitchers switch after every over, and no pitcher can throw more than 10 overs during a game. So you need a bunch of pitchers. The batter gets to hit the ball as hard and as far as he can. His other job is to protect the pile of wood behind him. The pitcher is trying to throw the ball by the batter and knocking off the little piece of wood on the top of the pile sticking out of the ground. If the batter hits the ball in the air and it goes past the little Green Monster protecting the field, what you and I call a Home Run, his team gets six runs. If he hits the ball on the ground and it hits the little Green Monster or it bounces over it (a ground rule double), his team gets four runs. If the batter hits the ball and it’s not a four or six run play, he and the other batter who is standing by the other set of wood sticking up out of the ground in the middle of the oval have to switch places (like running bases). Each time they switch bases they get a run. Think of this as a single in baseball. Sometimes they run back and forth for two runs (a double) or three runs (a triple). Remember before you started to glaze over I wrote that each side gets to bat until they get 10 outs. I need to explain how you make an out. You can be caught, bowled, stumped or run out. There are a few more ways, but remember no American sports fan cares about that. Caught is when you hit the ball in the air and one of the fielders catch it. I should have mentioned nobody wears a mitt on their hand except for the catcher guy. Bowled is when the pitcher hits the pile of wood. Stumped is when the batter swings and misses, the catcher catches the ball the hits the pile of wood with his hand while the batter is not in the batting box (crease). Run out is when your playing the running bases part of the game after the batter hits the ball and one of the fielders get the ball and throws it to the catcher or pitcher who knocks over the pile of wood while the guys wearing the goalie equipment are running back and forth. That’s all you really need to know to have a sort of intelligent conversation with your second cousin’s ex-husband from England about the game of cricket.